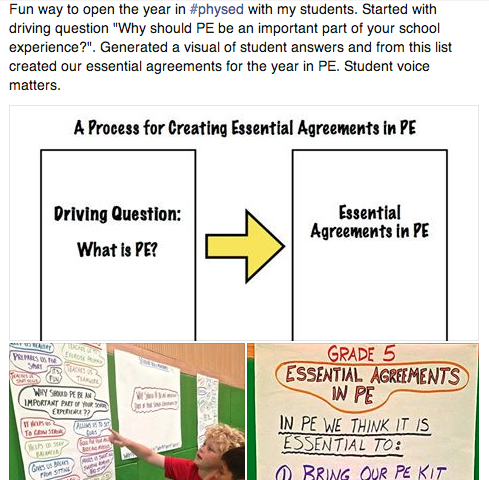 This morning on my newsfeed was a post from PE Teacher Andy Vasily, an amazing PYP educator who talks the talk and walks the walk when it comes to authentic integration and cross curricular teaching in the PYP. His blog is definitely worth checking out to get ideas for PE but also for excellent teaching practice ideas and ideas on how to collaborate across the school within a unit of inquiry. I really like the idea of starting with a question and using those responses to draw out your essential agreements. As a Learning Technology teacher, it would be easy for me to substitute ‘PE’ for ‘Technology’ and see where the kids take it. The same would be true for other single subject teachers. For homeroom teachers, asking “What is important about 2nd grade?” could start to illicit some ideas that could lead into essential agreements. The Important Book by Margaret Wise Brown could be a helpful lead-in to this discussion. Or you could go deeper with a question such as: “How can we motivate students, increase participation, and encourage deeper thinking in our classroom?”. Or, “What will students in our class be known for at our school?”, “How will we make this year remarkable?”, “What do you want this year to be like?”. You could gather these ideas using one of my favorite tools, Padlet, which lets students paste virtual post-its to a collective noticeboard. This requires no usernames on the part of the children, they just click on the board and paste a note. Thanks for the inspiration, Andy! Ooh. I like it. I could do the same in the library. Yes! I like the idea of using it in IT too. Good luck – would love to hear how it goes! I like it too! Love the driving question as a catalyst! And, I love Margaret Wise Brown, but didn’t know about The Important Book! I will definitely look into that one. Thanks! No worries. I like “The Important Book” – it lends itself to loads of uses. Love to hear how you get on with the driving questions.